Andarine S-4 (also known as Acetamidoxolutamide) is a SARM (Selective Androgen Receptor Modulators) that has been designed with the intention of minimising muscle wasting. Andarine has the exceptional ability to encourage the anabolic state, preventing the body from going catabolic and reducing the breakdown of muscles over the course of a workout, all while still allowing the retention of mass. Promoting anabolism whilst maintaining a low-calorie diet allows for a significant increase in both strength and endurance, allowing you to improve your performance during training. Most other SARMs will stack well with Andarine, giving you the ability to compound your results and experience further benefits within the same time frame. 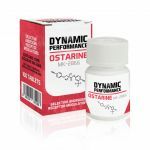 For example, a stack of Andarine S-4 and Ostarine MK-2866 would provide comparable results to a stack of testosterone and winstrol. Andarine Routine Recommended dosage Those who use SARMs commonly follow 8 week cycles for lean muscle gain and strength enhancement then take the following 8 weeks off to allow their recovery and natural testosterone levels to be restored.